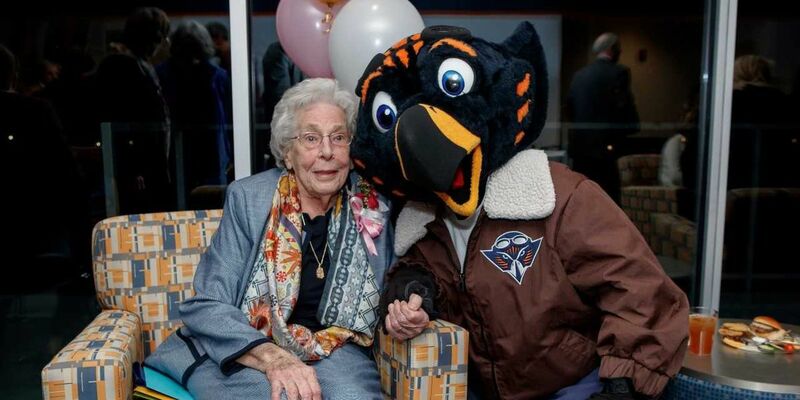 MARTIN, TN (KFVS) - The University of Tennessee at Martin hosted a birthday party to honor Bettye Giles, former director of women’s athletics, on her 90th birthday on Jan. 11. Giles served UT Martin from 1952 to 1995 and was instrumental in the establishment of women’s intercollegiate athletics programs at UT Martin and across the country. When Giles entered her higher education, field women were only permitted to play sports on the intramural level. “Our players bought their own food and, if we stayed overnight, we slept on the floor in our sleeping bags in the opponents’ locker rooms. I can remember we would stop at the grocery store and buy bologna, bread and Cokes,” said Giles in a 2011 interview with the Weakley County Press. Giles and other athletic administrators across the state gathered together to establish the Tennessee College Women’s Sports Federation in 1966 to promote intercollegiate competition and organize state championships for a variety of women’s sports. Giles served as the organization’s first president in 1973. These efforts eventually contributed to the passing of the Educational Amendment Act of 1972, a piece of national legislation most famous for its Title IX component, the requirement that higher education institutions provide equal opportunities for women’s athletics in order to receive federal funding. This legislation began a gradual change in women’s athletics nationwide that Giles says is still a work in progress. “Things are not totally equal, but they are getting that way. So, things are getting better as far as women in colleges with athletic opportunities,” said Giles in a recent interview with WBBJ-TV. Giles served as an associate professor of physical education and as a cheerleader sponsor from 1952 until 1973. She also started the women’s tennis program in 1952 and coached that team for eight years. Tennis became the first women’s sport to achieve varsity status at UT Martin. Giles became the university’s first and only director of women’s athletics in 1971 held the position until 1994. Giles influenced countless athletes during her decades at UT Martin, including Pat Head Summitt, the basketball player who would later become the winningest coach in the history of women’s basketball during her tenure as head coach of the Tennessee Lady Vols, and Jerry Reese, former general manager of the New York Giants. She is also the recipient of numerous awards from both academic and athletic organizations and was inducted into the UT Martin Athletics Hall of Fame in 1985. The UT Martin Bettye Giles Softball Field is named in her honor. Pat Head Summit also established the Bettye Giles/ Nadine Gearin Endowed Scholarship to honor her mentorship as well as that of Nadine Gearin, who coached the women’s basketball of which Summit was a part. All three of these women are memorialized in a bronze statue titled “Coaches," which stands outside the main entrance of the Kathleen and Tom Elam Center where the Skyhawks basketball teams play on Pat Head Summit court.